Following on the BIB report of Monday last week, the production team of the film You gave me a song: the life and music of Alice Gerrard send a progress report on all things connected with the project. 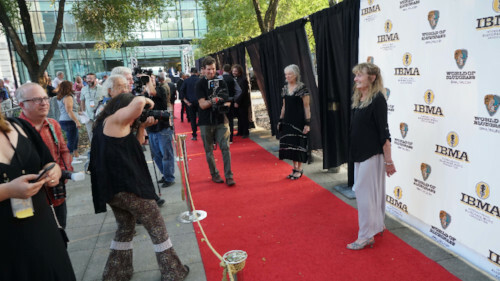 This includes the induction of Alice Gerrard and the late Hazel Dickens into the Bluegrass Music Hall of Fame - Alice is shown above being photographed during the recent IBMA World of Bluegrass in Raleigh, NC. More details, news, and photos are in the progress report, which also includes an appeal for further support to reach the Crowdfunder campaign's target.